What Does Stop 0xC000021a Error Code Mean? The Windows 0xC000021a stop error code occurs when critical system processes fails to run, like when the Winlogon.exe and Csrss.exe processes have stopped working. 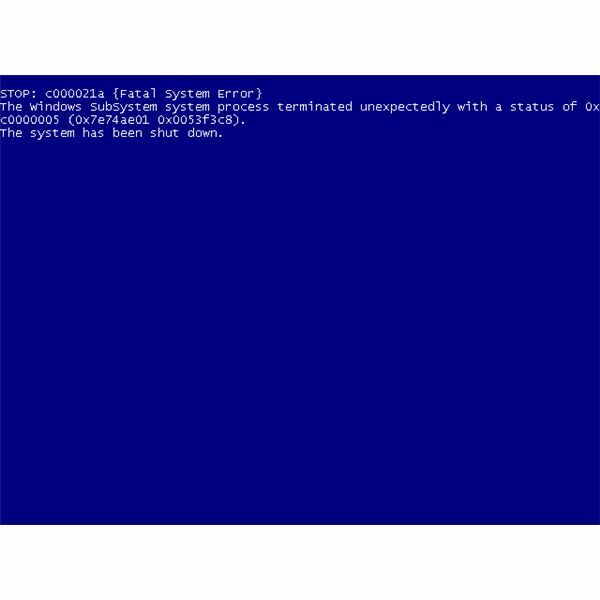 The Windows NT kernel will detect it and raised the stop C000021a fatal system error message or bluescreen (BSOD). It occurs because of a faulty third-party Graphical Identification and Authentication (GINA) DLL which is a replaceable DLL component that Winlogon.exe loads. Mismatched system files have been installed. A Service Pack installation has failed. An incompatible third-party program has been installed. Power supply unit (PSU) needs replacement. All versions of the Windows operating system use winlogon.exe and csrss.exe but if you've recently install new drivers, system services, or programs in Windows, you likely encountered the stop C000021a error message because of the said changes on the system. Open registry editor in Windows by typing regedit.exe in the run box. Hit enter key on the keyboard. In the right pane, determine if there is GinaDLL REG_SZ value. If GinaDLL is present, the cause of stop error c000021a is most likely from the changes made by the software or hardware vendor to the system which you installed. Fix it by using updated software or remove the recently installed software or driver. Report the issue to the software and hardware vendor so they will fix their program. If you cannot remove the software or driver due to BSOD when starting the computer, you can try using the recovery console or system restore function in Windows. Don't forget to first try using Last Known Good Configuration option to boot the computer before using restore or recovery features. Note that Windows 7 users may use the Startup Repair function included in Windows 7 installation DVD. Advanced users can also fix the problem by replacing GinaDLL. You can use Bart's Preinstalled Environment (BartPE) bootable live Windows CD/DVD to copy Gdi32.dll and replace the existing dll file in system32 folder of Windows. Another option is to install Windows in another partition so you can access the system that is experiencing the stop C000021a problem. What if Third-party GinaDLL is Not Present in the System? Debugging tools for Windows – download the appropriate version of debugging tools for Windows at Microsoft website. Analyze the dump file using the said tool to determine which processes or program has caused stop c000021a fatal system error. You can learn how to analyze the dump file by reading this article. Check Event Viewer for event logs – Event viewer is a quite useful utility in the Windows operating system. It records successful and failed events in Windows. Look for system logs in the event viewer and note the event ID, source ID and event type. There should be a record which processes or file (e.g. an .exe, a dll, or a sys files) caused a system failure. If the system is not infected with a virus or other types of malware, and the dump file is not showing any processes, system or program files as the cause of stop c000021a fatal system error message, try replacing the power supply unit (PSU) in your computer. The PSU will stop working over time and may need a replacement.